No heating? Burst pipe? 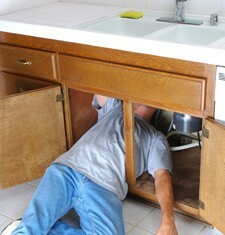 You need an expert plumber now! There's nothing worse than that feeling of helplessness when your heating doesn't work, the tap won't run hot or there's water gushing out of a burst pipe. Don't panic! Instead, call on us. We're expert emergency plumbers who cover the whole of Bristol offering an affordable 24 hour emergency plumbing service. Perhaps your plumbing emergency is a burst or frozen pipe? Perhaps your boiler has broken down and the children are cold? Whatever your emergency, call and a 24 hour emergency plumber can be there within two hours to get you back up and running. We won't let you down - that's a promise. We don't charge call out fees, not even for 24 hour emergency plumbing. So call now for competitively priced plumbers in Bristol. Call 0117 345 9036 any time you have a plumbing emergency. We'll aim to get to you as soon as we can in order to fix whatever needs fixing - and do it all at a price that will leave you smiling.